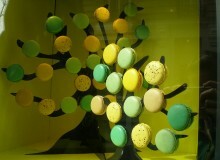 J’adore les marrons ! 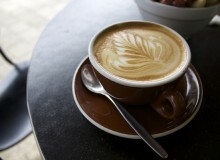 I admit it, I’m addicted to them! 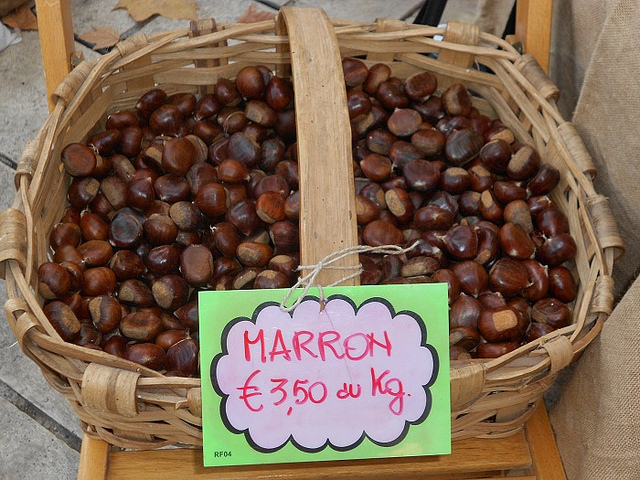 Every October brings chestnut season and all the chestnut festivals in France – it is the sign that the holiday season has arrived! So grab some roasted chestnuts and some vin chaud and let’s get the ‘Chestnut Party’ started! Fête des Châtaignes pop up all over the Alpes-Maritimes area in France¹, from October through November. It is a celebration of the beloved and versatile chestnut. 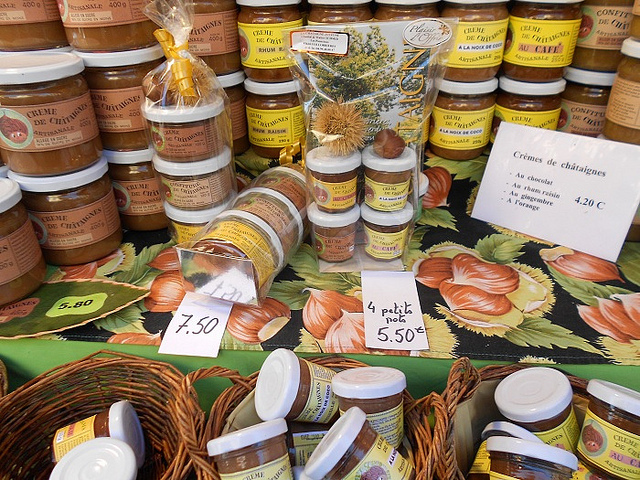 Vendors are usually local and bring their chestnut goodies for you to sample and buy, including: Chestnut Creme, Confiture, Candid Chestnuts, Cakes, Muffins, Cookies, Beer and my favorite freshly Roasted Chestnuts! I’ve never met one person who doesn’t like chestnuts! Chestnuts are so versatile, used in sweet to savory dishes. They also pack a nice nutritional punch. Did you know that chestnuts, unlike other nuts and seeds, are relatively low in calories; contain less fat but are rich in minerals, vitamins and phyto-nutrients that benefit health? Oui! Fresh in season chestnuts are available all over the globe. The ancient Greeks are thought to have been among the first to cultivate the chestnut. Today, the world’s top ten leading chestnut producers are China, Turkey, Korea, Italy, Japan, Spain, Portugal, France, Greece and Albania. Now don’t you worry my USA peeps, major states for chestnut production include California, Oregon, Washington, Michigan, Florida, Ohio, and Virginia. 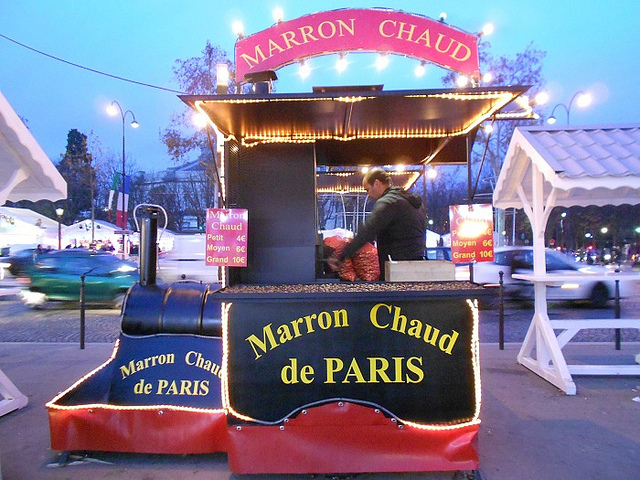 In New York for example, you’ll find chestnut ‘roasting trucks’ on the corners during the holidays just like in Paris. Chestnuts have long played an important part in the Mediterranean diet. In some countries, chestnuts are eaten much like potatoes, usually boiled them and eaten plain. 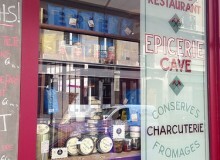 Here in France, they also use chestnut flour to make fabulous desserts and pastries. Here’s how to pick good ones. Their skins should have a healthy glow and brown shine. They should be firm and feel solid, with no air between the skin and the underlying flesh. They should be blemish free. And the most important look for pinholes, which likely means worms have entered and could still be inside – UMMM GROSS! Preheat the oven to 300°F. Rinse chestnuts under water and lay them flat side down and score the shells in an “X” form. Place on cookie sheet and roast on a center shelf until the meats are tender and easily pierced by a knife or toothpick, about 25-30 minutes. Wrap in a towel and squeeze them to crack hot shells. Peel and eat. Boiling chestnuts: Start a pot of water boiling. Rinse and score the shells like above. Drop in the nuts and boil for about 15 minutes, peel them right away. Beware that boiled chestnuts can be hard to peel and tend to crumble, but this method is perfect for soups, stews and salads. Store extra peeled chestnuts is air tight container in fridge for up to 4 days & or freeze for up to 9 months. 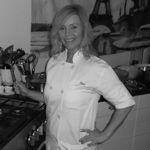 Enjoy chestnut season – roast them and serve with vin chaud, like I do! 1. 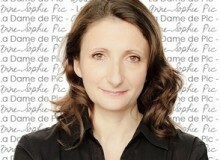 Fête des Châtaignes – Alpes-Maritimes on Côte d’Azur Tourisme site. 2. Chestnuts nutrition facts on Nutrition and You site. 1. 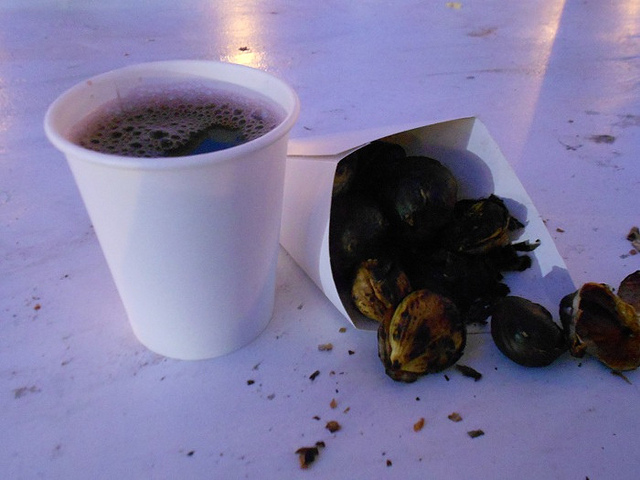 Freshly Roasted Chestnuts & Vin Chaud on the Champs Elysees. 2. 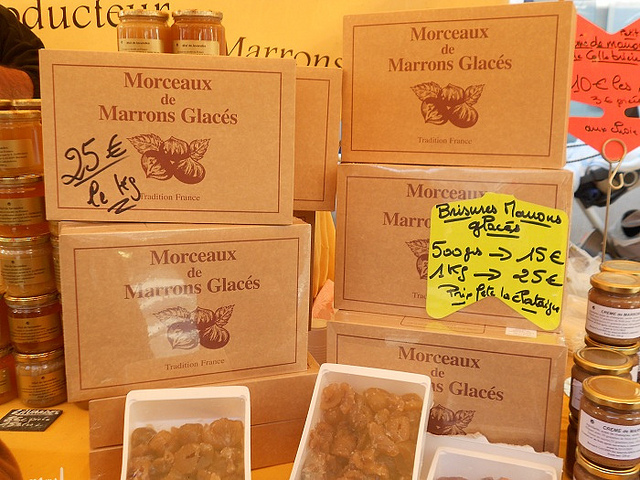 Marron Glaces Vendor at the Fete de la Chataigne in Cagnes Sur Mer. 3. Chestnut Creme Vendor at the Fete de la Chataigne in Cagnes Sur Mer. 4. Roasted Chestnut Vendor on the Champs Elysees. 5. Basket of fresh Chestnuts at the Fete de la Chataigne in Cagnes Sur Mer. 6. 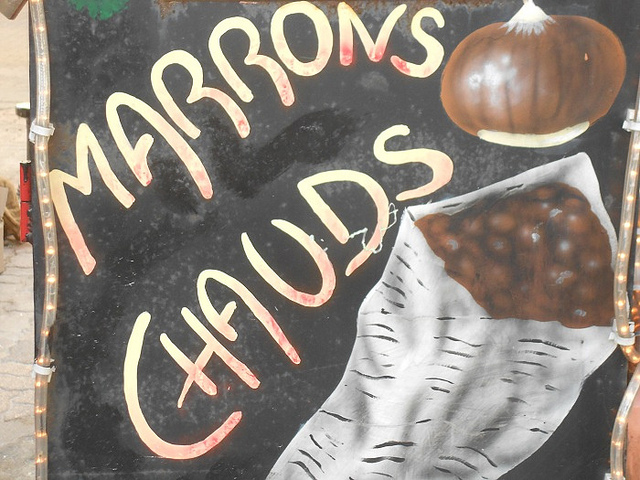 Marrons Chaud sign at the Fete de la Chataigne in Cagnes Sur Mer.